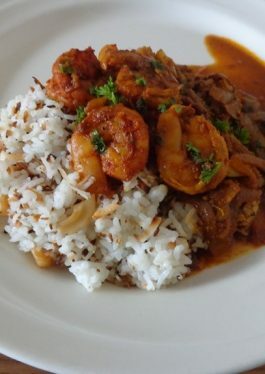 Check out this exotic Shrimp Curry with Coconut Cashew Rice recipe from VeeTee member Hidemi Walsh and the story behind it: Inspired by one of my favorite curry served at a Bangladesh restaurant in Tokyo. The chef told me the recipe briefly but it has too many ingredients to remember. To simplify and make it easy, I created this recipe. As for the rice, this is my original and most favorite rice when I eat curry. Easy to make and nice coconut flavor, crunchy nuts and fluffy healthy VeeTee rice! Perfect dinner or lunch. 1. Make curry. In a bowl, mix together 1/2 teaspoon salt and 1/2 teaspoon turmeric. Pat shrimp dry with paper towels then put shrimp into the bowl. Mix to combine. 2. Peel and slice onion thinly. 3. In a deep skillet, heat olive oil over medium heat. Add onion, garlic and ginger to the skillet and cook stirring constantly until mixture turns lightly brown. Add chili, cumin and coriander to the skillet and cook stirring constantly until combined. Stir in water and bring to a boil. Reduce heat to medium-low and simmer stirring occasionally about 10 minutes. Add shrimp with the marinade remaining in the bowl and cook stirring occasionally until shrimp is cooked through. Stir in cilantro. Add black pepper to taste. 4. 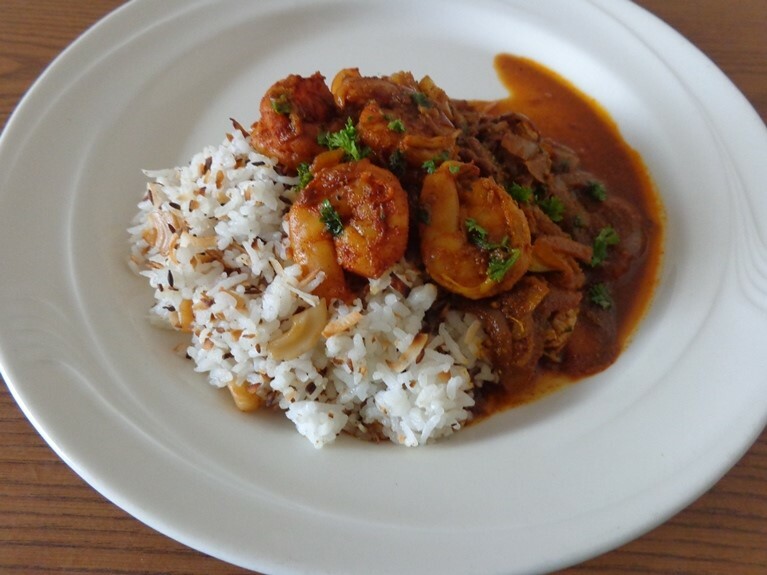 Make coconut cashew rice. Cook rice following by the package directions. Then transfer the rice into a medium-large bowl. In another skillet, melt butter over medium heat. Add cumin seed to the skillet and cook stirring constantly until fragrant. Add coconut flakes and cook stirring constantly until coconut flakes are almost golden brown. Add cashew nuts to the skillet and cook stirring constantly until coconut flakes are golden brown. Then transfer the mixture into the rice bowl and mix to combine. Add salt to taste and mix to combine. 5. Put rice and curry into each serving plate.